the skin can no longer tighten around the skeleton… causing sag. There is a normal rate of decline in bone density in both men and women as they age. Bone mass increases in childhood and reaches maximum density by early adulthood; after that, it will gradually decline for the rest of your life! Studies have shown that women had a significant decrease in facial bone volume at a younger age than men so they showed signs of aging sooner. A woman can lose up to 20% of her total facial bone mass 3 to 6 years after menopause. Studies have also shown there is no age limit on bone modeling (building of bone). Women in their forties, fifties, sixties and all the way through their nineties can and do build bone if they perform resistance training. 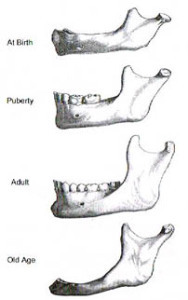 Diagrams: Areas of eventual facial bone loss. As facial bones decrease with age: dissolving, shrinking, and leaving empty spaces, the skin can no longer tighten around the skeleton, causing sag. Looking at the diagram above one can easily see how hollow eyes begin to form. When the T-zone area of the face begins to shrink (the area between the eyebrows) the result causes sagging eyebrows and the appearance of deflated eyelids. As the flat bone (Maxillary Angle) that supports the cheeks begins to shrink, the fat pad slides down and forward, causing nasolabial folds and jowls. It doesn’t take much of an imagination to figure out what the jawline will look like once the mandible (jaw) begins to shrink. Even with the success of her original and 2nd edition program, she was not content to end it there. When Deborah reached the age of 60, most new acquaintances still guessed her to be in her 40s, but Deb was noticing some subtle facial changes she was not happy with. An extensive investigation led her to believe bone atrophy was the cause. She then developed Jolting and Pressure Reps for the remodeling of facial bone (increasing the bones density), and Cross Stretching to promote collagen and increase elasticity. The 2010 3rd edition of FlexEffect Facialbuilding includes these two completely new and innovative anti-aging techniques. Please visit our Facialbuilding page for more training information.